Designed by Voysey in the 1890's, this is elegance personified. This oak mirror was used in many of his houses, including his own, and was shown in many photographs. It has typical Voysey detailing, natural oak finish, ornate cornice, excellent proportions. Approx. Ht 22" high. Supplied with a mirror & back hook for hanging. We usually hold these in stock. POA. 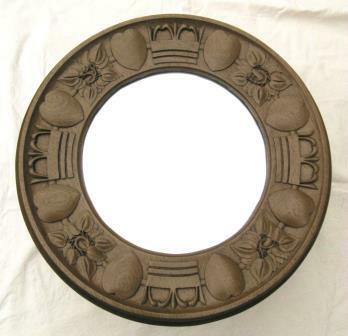 This mirror is a copy of a beutifully designed and stunningly carved frame. 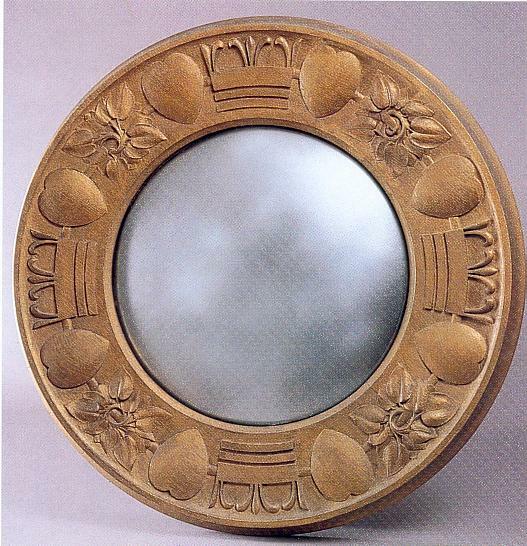 Voysey designed this mirror, in Dec 1901, for W Ward Higgs, and was intended for 23 Queensborough Terrace, Bayswater, London. Voysey's notes for the mirror state 'to be carved in hardwood and gilded; the grain of the wood is not to be filled up' ( to leave a better surface texture, typical of Arts & Crafts thinking ). The frame includes oft used designs of hearts, crowns & leaves, more typically seen on his wallpaper & fabrics. This is one of the best pieces we have reproduced of Voysey's. We followed both the design by Voysey and an original example owned by Voysey himself for accuracy. The detailing is just superb. You have a few choices of mirror. 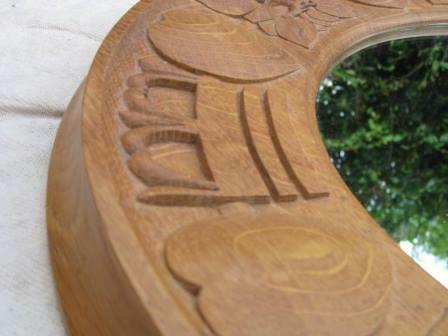 We can offer the mirror in natural oak, hand carved. While this is not accurate to Voysey's design spec., it is something he would have done himself. And it looks superb, as you can see the wood mellows to that beautiful oak colour over the years. It is expensive to produce, be warned. The other option is to have one of our copies in cast resin. If you're first reaction is this sounds 'cheap'; let me answer that. Voysey's original had a gold finish, so you don't see the base material - so whether that base material is wood, plaster or resin what difference ? Besides resin is stable & not prone to shrinkage, cracking, movement, etc.. Also, if I put one of our copies beside the original you would struggle to tell the difference. 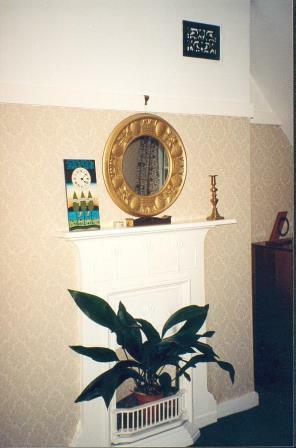 The point is you have an authentic looking Voysey mirror on your wall. Or you always have the option of ordering one in oak & it will cost you over 10 times the price. 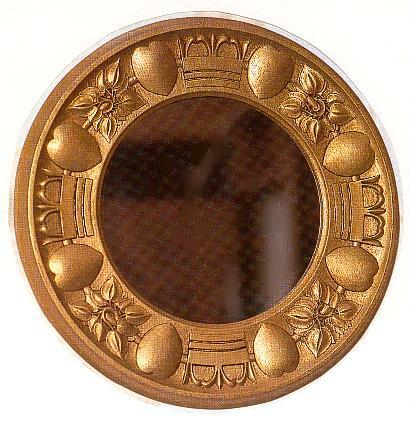 The mirror is finished with an antique gold finish. Dia. 22". We usually have 1 or 2 of the gold ones in stock. Ask about the other finishes. £ POA. This mirror frame is also available in a generic medium dark Oak finish (shown below) if you need it to blend in with dark oak original furniture & interiors. This brings out the Arts & Crafts flavour even more. 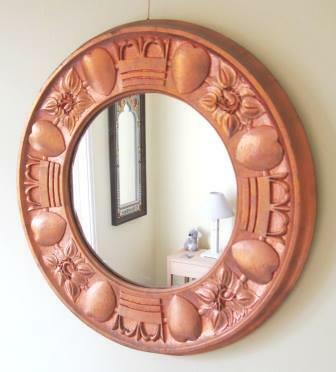 We even produced one of these mirrors with a hand copper leafed finish, Bottom RH photo. This looked really stunning. The copper leaf finish could also be antiqued, but we left this one in bright copper, so it would 'age' naturally. Made to special order. Bottom LH shows a selection of our pieces, including the oak & round mirrors, to help give them scale. One of the gold mirrors in a Voysey bedroom, bottom RH.